Jan is a new member of the Anyone’s Child project. 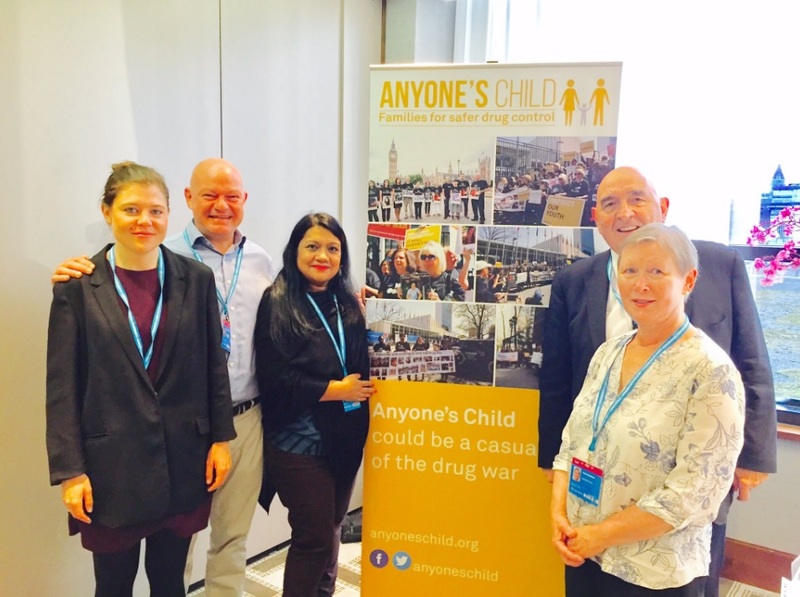 Read her story of how her family has been impacted by our current approach to drugs. If you too have been affected by similar issues, please get in touch and tell us your story. If Anyone Else had told me that one of my children would become a heroin addict, living on streets and challenging us all to the hilt, I wouldn’t have believed them. Far too sensible. If Anyone Else had told me that I would refuse her shelter, I wouldn’t have believed them. 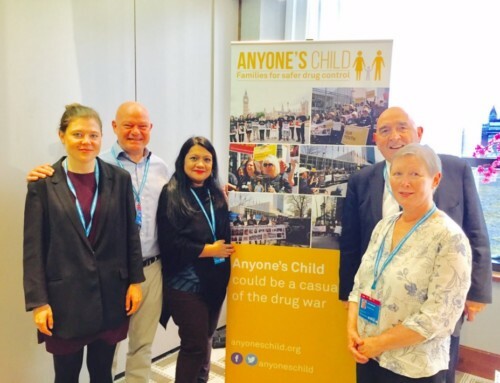 And would they have understood that when I finally did refuse, it wasn’t because I didn’t love her but because I loved her deeply; could they understand the profound emotional fragmentation, when, time after time, your child goes back to the streets, not because of the drug itself, but because it is criminalised. Despite my unconditional love, there came a point when I couldn’t deal with the painful repercussions of addiction and withdrawal in that context. We did well, we had highs, we kept hope. We just got low on resources, on our own. My daughter is Anyone’s Child. A bright, fun, creative, compassionate, strong, sensitive child. An intelligent, rebellious, strong minded, uncertain, curious, determined teenager. Us, a mixed family, ‘professional’, thinking we were making good lives for our children. Middle class by education, lower middle class by income. Tutors, trainers, writers, thoughtful, clever people. So how did ‘it’ happen to us? I’m not anti-recreational drugs – humans seek highs, and we have open attitudes. I distinguish between recreational and dependent. So my daughter, a heroin addict? With hindsight, I made two mistakes: I didn’t understand how easily available heroin was: moreover, I thought we were different. Our children would be protected. Well we’re not. And they weren’t. 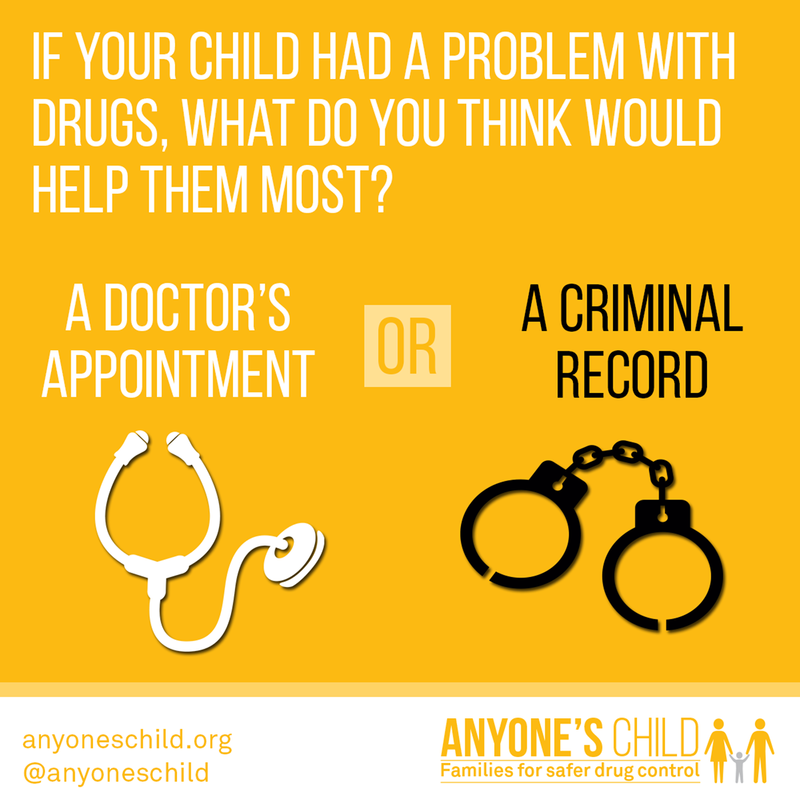 Anyone’s Child might try heroin. And that, quite simply, is how it can happen to Anyone. Years on, I appreciate every single moment of my daughter’s life, that she survived, and is who she is: I feel for every family with daughter or son that didn’t make it. So cruel. 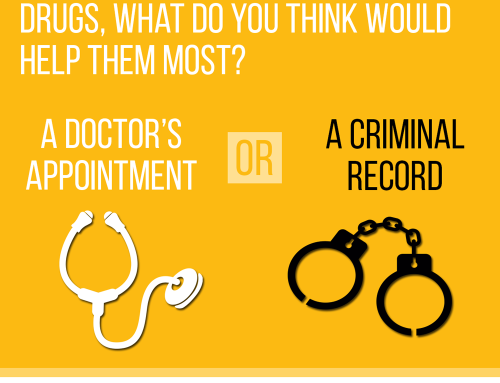 Let’s, please, legally regulate drugs. Let’s protect Anyone’s Child from death, from the life threatening illnesses spread by shared needles, from homelessness, mental health issues, vulnerability to assault and exploitation: protect them from the extreme states of dependency that can lead to assault or exploitation of others, from degradation of self, from painful lonely withdrawal in unsafe conditions, from hopelessness and invisibility. I regret that I couldn’t do that for my daughter, yet together we could do it for Everyone Else’s children. 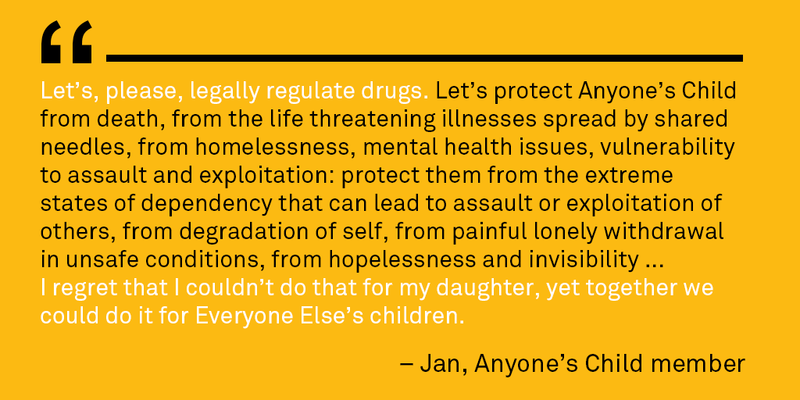 For more stories from families who have been harmed by the war on drugs, visit this section of our the Anyone’s Child site.